Khalifa Haftar has been part of the Libyan political scene for more than four decades, shifting from the centre to the periphery and back again as his fortunes changed. On 4 April the military strongman ordered his Libyan National Army (LNA) to advance to the capital, Tripoli, where the internationally recognised government is based. The LNA says its aim is to restore security and fight armed gangs and "terrorism". The push comes months after the LNA made advances elsewhere in Libya, a situation likely to have spurred Mr Haftar on to seek military control of the whole country. Prime Minister Fayez al-Serraj of the UN-backed Government of National Accord (GNA) has vowed to defend Tripoli, accusing Mr Haftar - who is popular in the city of Benghazi for his role in driving out Islamists - of launching a coup. The offensive by Mr Haftar, who has his powerbase in the east of the country where he is allied to a rival government, comes amidst UN-led plans for talks to help facilitate the delayed general elections which were to be held last year. Born in 1943 in the eastern town of Ajdabiya, Mr Haftar was one of the group of officers led by Col Muammar Gaddafi which seized power from King Idris in 1969. Gaddafi put Mr Haftar - recently promoted to field marshal - in charge of the Libyan forces involved in the conflict in Chad in the 1980s. This proved to be his downfall, as Libya was defeated by the French-backed Chadian forces, and Mr Haftar and 300 of his men were captured by the Chadians in 1987. Having previously denied the presence of Libyan troops in the country, Gaddafi disowned him. 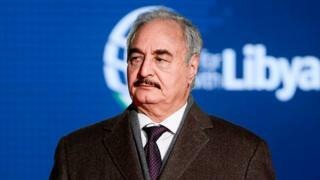 This led Mr Haftar to devote the next two decades towards toppling the Libyan leader. He did this from exile in the US state of Virginia. His proximity to the CIA's headquarters in Langley hinted at a close relationship with US intelligence services, who gave their backing to several attempts to assassinate Gaddafi. After the start of the uprising against Gaddafi in 2011, Mr Haftar returned to Libya, where he became a key commander of the makeshift rebel force in the east. With Gaddafi's downfall, Mr Haftar faded into obscurity until February 2014, when he outlined on TV his plan to save the nation and called on Libyans to rise up against the elected parliament, the General National Congress (GNC), whose mandate was still valid at the time. Why is Libya so lawless? His dramatic announcement was made at a time when Libya's second city, Benghazi, and other towns in the east had in effect been taken over by the local al-Qaeda affiliate, Ansar al-Sharia, and other Islamist groups who mounted a campaign of assassinations and bombings targeting the military, police personnel and other public servants. Although Mr Haftar did not have the financial capacity to put his plan into action, his announcement reflected popular sentiment, especially in Benghazi, which had become disenchanted with the total failure of the GNC and its government to confront the Islamists. In May 2014 Mr Haftar launched Operation Dignity against Islamist militants in Benghazi and the east. In March 2015 Libya's elected parliament, the House of Representatives (HoR) - which had replaced the GNC - appointed him commander of the LNA. After a year of little progress, in February 2016 the LNA pushed the Islamist militants out of much of Benghazi. By mid-April this had been followed up by further military action that dislodged the Islamists from their strongholds outside Benghazi and as far as Derna, 250km (155 miles) east of Benghazi. The HoR appointed him from lieutenant general to field marshal after he helped secure key oil terminals known locally as the Oil Crescent. Mr Haftar's popularity is not necessarily shared elsewhere in the country where he is remembered more for his past association with Gaddafi and his subsequent US connections. He is also detested by Islamists who resent him for confronting them in Benghazi and elsewhere in the east. The LNA, however, is likely to have gambled on local groups in Tripoli to come out in support of its latest operation to seize the capital. But an umbrella group of the city's most powerful militias, affiliated to the GNA, launched a counter-attack hours after the LNA announcement. Before the latest offensive Mr Haftar was in Saudi Arabia where he met with King Salman. Several analysts say the proximity of the two events shows a connection between adherents of the Salafi Madkhali school of conservative Islam in Mr Haftar's forces and the kingdom's status as the origin and "sponsor" of Salafist ideology. The GNA's Special Deterrence Forces (SDF) is also thought to include Madkhali members, which likely explains the rumoured split sparked by the latest offensive. Egypt and the United Arab Emirates have also been named as backers of Mr Haftar. France has also provided tacit backing for the strongman, which has resulted in a public falling out with Italy, which supports the UN-backed government. The two European countries see Libya as a key partner in stopping the wave of migration from sub-Saharan Africa. France, for example, carried out unprecedented air strikes on the LNA's biggest opponents - Chadian opposition fighters - in the midst of battles in the south. "Haftar has understood that migration for him is what the Islamic State is for the Kurds" - the key to international legitimacy," Mattia Toaldo, senior policy fellow at London's European Council on Foreign Relations, told Foreign Affairs magazine. Russia, which has long stressed it deals equally with Libya's rivals, has expressed concern over airstrikes against the LNA during its latest offensive. And US Secretary of State Pompeo said the US was "deeply concerned about fighting near Tripoli" and stressed the need for talks. While Mr Haftar has been ambiguous about his own political ambition, it is likely that this is confined to a key role for himself in the new army under the national unity government and, more generally, for the LNA in the new armed forces.